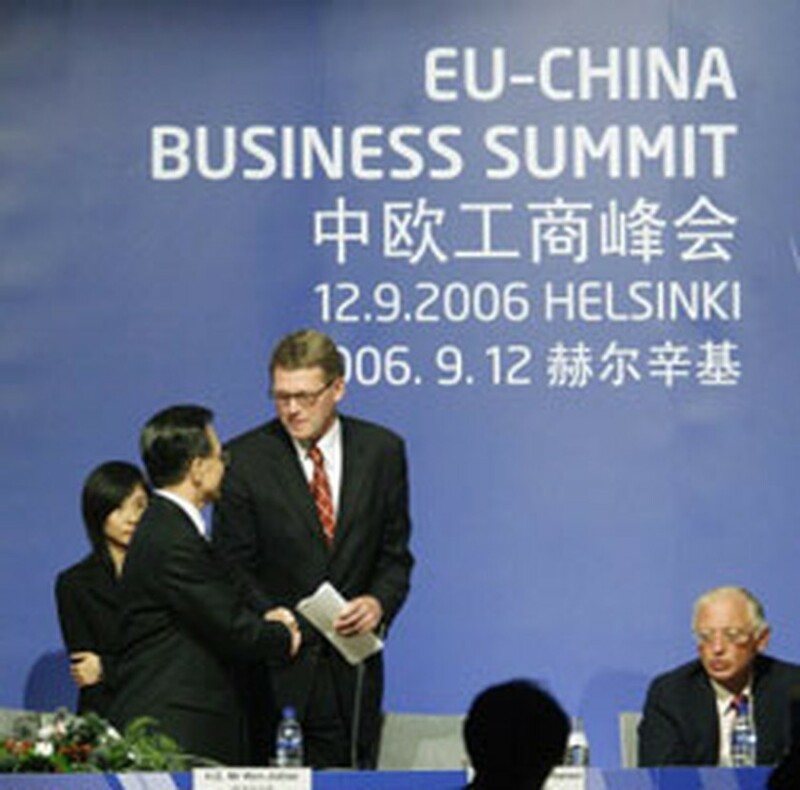 Chinese Prime Minister Wen Jiabao (L) shakes hands with his Finnish counterpart Matti Vanhanen (C) at the EU-China Business Summit in Helsinki. The EU replaced the United States as China's biggest trading partner last year, said Xu Kuangding, chairman of the China Federation of Industrial Economics (CFIE) on Thursday. As one of the keynote speakers at the opening of a Sino-European economic summit, Xu said Sino-European trade, with a volume of 217.3 billion U.S. dollars, has exceeded the Sino-U.S. trade volume by some 5.7 billion dollars. European companies such as Airbus, Siemens, Nokia and Volkswagen, made the EU the fourth largest investor in China and China's most important supplier of technology, Xu said in a speech at the second Hamburg Summit -- "China meets Europe." Speaking of EU's concern over intellectual property rights protection in China, Xu asked European business leaders to show a little more patience on this issue. "Until fairly recently, China had a long history of having a largely agrarian-based economy where it was customary to try and learn from one's neighbors. The concept of intellectual property was therefore quite new to China's burgeoning industrial sector," he said. The Chamber of Commerce Hamburg, which initiated the summit, expected more than 350 economic, political and scientific leaders from both China and Europe to attend the event which will run until Friday.